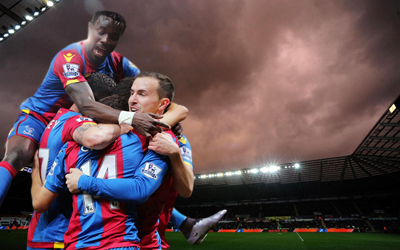 Crystal Palace Tickets – Get your football tickets here for all matches. From the first strains of “Glad All Over” as the players enter the pitch, there’s no mistaking the love the Selhurst Park crowd has for Crystal Palace FC. Get tickets to Crystal Palace match and we're sure South London’s footballing hotbed will sweep you along on a wave of emotion, you’ll soar with the Eagles as you join in with the Palace faithful to sing the team to victory. It worked in the 2015-16 FA Cup as they reached the final and dared to believe that glory beckoned. And after you’ve sung your heart out in the Holmesdale Road End, you are just a few minutes from centre of London where a fantastic capital city never stops to sleep. Any time of day or night, the streets team with life in theatreland, clubland and at all the wonderful sights on offer. Crystal Palace, founded in 1905, had to wait until 1920 to join the Football League. Since then, the Eagles have flitted between the lower divisions before establishing themselves as a regular fixture in the top two tiers since the 1980s. Malcolm Allison and Terry Venables created the ‘Team of the 80s’ with a vibrant young squad featuring future England captain, Kenny Sansom. Other notable Crystal Palace players include Arsenal legend Ian Wright, Wales manager Chris Coleman, Attilio Lombardo and current England internationals Wilfried Zaha and Nathaniel Clyne. The Eagles best finish in the top flight of English football came in the old First Division in 1990/91 when they were third. Palace were founder members of the Premier League and in 2015/16, they recorded their best-ever Premier League finish in 8th place. It broke their cycle of promotion and relegation to and from the top division. For a club which has faced administration in the past, to have risen to the top half of the Premier League with a limited budget is an achievement of which they can be proud. Palace mean to stay there as well. Alan Pardew twice broke the club’s transfer record when he signed Andros Townsend from Newcastle for £13m and Christian Benteke from Liverpool for £27m in August 2016. 2016/17 was a season of turmoil at Selhurst Park. Alan Pardew was sacked at Christmas with relegation threatening. His replacement, Sam Allardyce, guided them to safety but retired at the end of the season. Frank de Boer, the legendary Dutch defender, took the reigns and is moving quickly to make 2017/18 a season to remember for all the right reasons. Peter Simpson, 165 goals in 195 appearances Simpson signed for Palace in 1929 and almost immediately set records. He scored the most goals for the club in one season – 54 in 1930/31 – including 46 in the league, also a record. He netted six against Exeter City, the most any Palace player has scored in one match whilst his 4 against Newark Town is the most any Eagles star has scored in an FA Cup tie. He also rattled in 20 hat-tricks, still the most in the club’s history. 8th April 1990, Villa Park. In September 1989, Liverpool beat Crystal Palace 9 – 0 at Anfield in a First Division match. The following April, the two teams met again at Villa Park in the FA Cup semi-final. The Reds took the lead through Ian Rush but Mark Bright equalised with almost the first kick of the ball in the second half. Gary O’Reilly gave Palace the lead before Steve McMahon and John Barnes turned the match around. It wasn’t over; Andy Gray sent the tie into extra time with an 88th minute goal before Alan Pardew scored with ten minutes of extra time remaining. Cue pandemonium for the Palace fans. Wembley beckoned! Select your Crystal Palace fixture from our events table above or our match menu. You can buy for home games or Crystal Palace away tickets. In the review your order page you will be able to review Crystal Palace tickets that you have ordered and the total price you will be paying in the next stage if you have been given a coupon or discount code, enter this in the box and click “apply”. The final Crystal Palace ticket prices will be calculated and then click “Proceed to payment”. There are no hidden fees or costs and the total price you see is what you will pay for Crystal Palace football tickets. After payment is successfully processed you will be redirected back to our site and you will receive a confirmation message. An email with your Crystal Palace ticket order details will be sent to the email address you have provided during your registration. How To Get To Crystal Palace Stadium?